On 12/11/02, the OD reported in an article by Tom Lambert that EDGE had withdrawn its application for an Army Corps of Engineers Wetlands permit to build a chip plant. review that included the state and federal agencies. EDGE officials stressed Tuesday that the project is not in jeopardy. Reynolds, EDGE's senior vice president of planning and development. In an OD Article today, the lack of the wetlands permit is called "A significant roadblock to attracting a nanotechnology company ." When will our elected officials realize that EDGE is either incompetent or lazy, and start demanding some answers? It's time to get rid of them! In January, Mr. Picente wanted to sell the old County Airport to State Homeland Security. Last week he was concerned about the state's committment to the Homeland Security project. Today, following a meeting Monday with state officials, he thinks the state is committed. "It could work out to be very good for the county," Oneida County Executive Anthony Picente said. How did Mr. Picente come to this conclusion? Was he told something specific that impressed him? Was he shown a marketing study that demonstrates that a demand exists for the proposed facility's services? Was he shown a study demonstrating that people or other government agencies would be willing to pay for them? Was he shown a significant financial commitment on the part of the state beyond $6 million (which is only "chump" change compared to other state investments in education facilities elsewhere)? Or is Mr. Picente just engaging in pie-in-the-sky wishful thinking? "The details of the lease still are being worked out." "A driving course with twists and turns" - Why not use Route 51 through Ilion Gorge? This road not only presents challenges, it comes complete with a water hazard! "A mock Main Street with buildings" - How about Utica State Hospital? It not only has many abandoned buildings, but a high rise is included! "Space to simulate a hazardous materials incident" - Harbor Point is the obvious choice here. Chemicals are already in the ground, ready to be sampled! Seriously, Oneida County is the biggest risk-taker in this deal, and the Old County Airport is simply too valuable a piece of property to waste on a Homeland Security Training Center -- which is nothing more than a "venture" with no guarantee of sustaining itself. This region is already brimming with state facilities --- and if the State's plans to cut back on prisons are implemented, we'll have only more abandoned hulks like the Utica Psych Center to have to deal with. Little to no attempt was made to market the old O.C. Airport for its "perfect-fit" use: as an airstrip with related uses. Maybe the County is afraid of creating competition for itself -- but that should be no excuse for not seeking to give the taxpayers the greatest potential return for their already substantial investment there. Honda Aircraft recently announced that it would be constructing business jets at the airport in Greensboro, NC, creating over 200 jobs averaging over $70,000 a year. Did anyone from here court them? The entire airstrip and related buildings could have been made available for their private use. There might be other potential customers -- but we'll never know if we don't look for them. Homeland Security will be nothing but insecurity for us if we go along with the state's plans and wait and hope for something good to happen. Several articles appeared today in the OD about the Herkimer County wind farm projects. The articles suggest that the debate is focused on the need for renewable energy vs visual impacts to and diminution in value of neighboring properties. However the articles understate the extent of the negative impacts. If wind energy was cheap, and if the host communities would benefit from same, there would be little concern. That is because people are willing to put up with some visual blight and inconvenience if they know they will benefit. Unsaid here, however, are the facts that the power these wind farms would produce is neither cheap nor needed by the communities and counties hosting the facilities. Upstate, we are relatively awash in power. Therein lies the real problem. Power produced here will benefit people living elsewhere. Not only will the wind farms' immediate neighbors suffer impacts, but so will everyone living along the route of the power lines that become necessary to take the electric "product" to "market." The impacts are not only visual, but also economic (in that properties along the way will lose significant value) and potentially to human health. So, "divide and conquer" becomes a potential strategy for anyone wanting to put up a power line. Dangle the prospect of making lots of money in front of potential wind farm landowners and you produce supporters of power lines. Of course, with a windfarm-powerlines setup, there will be some winners and many losers if purely market forces are left to control. This is why we need government: to regulate behavior to maximize the number of winners and minimize the number of losers. If the windfarm-powerline connection was recognized, it might be possible to set up a regulatory scheme where such facilities are located where they will create the least amount of harm -- and perhaps provide compensation for those unavoidably affected. But no one in government is leading the way. Herkimer County amazingly is planning on PILOTing these projects (agreements to encourage their development by reducing their taxes). If Herkimer County feels it is getting a benefit from these projects, then it is justified in providing the agreements. However, Herkimer County should then be expected to take its fair share of the impacts by accepting the alternative route for the NYRI power line that would pass through its southern towns. NYCO got the wheels turning with a post about NYC, including a reference to a Times article about the NYC water supply that says that by 2020 NYC will have 9 million people and they will be looking for something to drink. If you are old enough and lived in the Utica area in the 1970s, you will remember the concern local residents felt over proposals for NYC to use Hinckley Reservoir (Utica's water supply) as a new source. Would Utica people be paying NYC for water? Would Utica's water use be limited to the per capita use found in NYC? 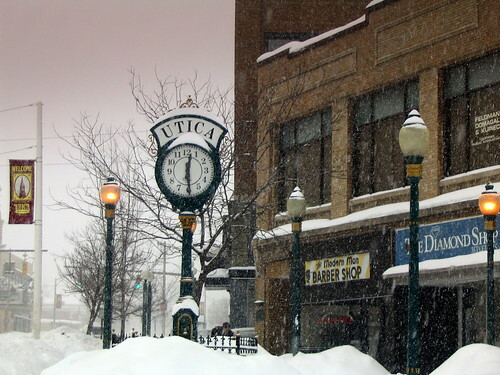 Would Utica's growth potential be limited by limitations on water use? Fortunately, all these concerns were swept away by our local representatives in Albany, notably, Sen Donovan, because back in those days, this area still had some clout. These days, the threats to the Utica water supply come from within: the Mohawk Valley Water Authority, which is hell-bent to give away the water needed for future generations in Greater Utica and Herkimer County. Hopefully, common sense will eventually prevail. Meanwhile the larger issue of Upstate resources, not only water, but power as well, being appropriated to support Downstate growth remains. We already blogged about how the change in Upstate's representation in state government in the 60's appears to have marked the beginning of the economic and population decline for all areas north of Downstate and west of the Hudson Valley. Because of the Downstate majority viewpoint, policies that made sense for Downstate were implemented. The result: Downstate continues to grow (albeit slowly) while Upstate is becoming depopulated. The string of urban pearls across NY State's middle has been allowed to turn to rust: a tremendous waste of infrastructure, and a disaster for the people left behind to support it. Local policies and our overlapping local municipal governments have exacerbated the problem by encouraging more infrastructure in suburban areas. If our political leaders are serious about our well being, they need to start thinking now about what should be state policy. Do we want laissez faire and allow pure market forces to determine policy? The end result will be what we've had: a growing Downstate, a declining Upstate, and more waterlines and powerlines disrupting our lives. Or do we want something different, such as policies that will encourage use of the infrastructure we already have in place upstate. How about implementing the concept: The people who bear the negative impacts of a public project must be the one's who receive the benefits. . . or . . . Those who would benefit from a public project must be willing to assume all the negative impacts? This would seem to be a good place to start the discussion. Prestwick Glen . . . Hit from Two Directions . . .
First we're hit with the news that the wealthy new residents of the Prestwick Glen project won't pay their fair share of taxes because of an agreement Glen parent Presbyterian Homes entered into with the Town of New Hartford. NOW we find out that the Oneida County Industrial Development Agency actually issued bonds last year to support this development! It sure looks like local government serving special interests again! Cathy at New Hartford Online has done a great job digging up all the sordid details and machinations in two posts: "Preswick Glen and Oneida County Industrial Development" and "Prestwick-the Saga Continues". Give them a read. A recent article in "The Communicator," a publication of the Public Employees Federation, reveals that the State had better be ready for a fight if it continues with its Pataki-era plan to move state data operations from Albany to Utica. The union claimed that the project was not financially feasible when first proposed at a $75 million cost. Now the estimate is $99.5 million. Does it make any sense for a new administration to take on this mounting cost? As much as the data center would be a shot in the arm for the Utica area, the state should not do this if it makes no sense financially and otherwise ... just like it makes no sense to for the state to spend an extra $300 million to prepare Luther Forest for the AMD chip fab plant when Marcy is ready now. In that vein, our new county executive, Mr. Picente, was heard on WIBX this weekend offering a new excuse on why Marcy lost the chip fab: the water fight between the Mohawk Valley Water Authority and the State Canal Corp. Of course that is rubbish. (1) The Marcy site already has a water supply, while Luther Forest has to develop a new one (groundwater supplies there are inadequate). (2) The Water Authority is already permitted to serve the Marcy site (as MVWA's service area map makes clear), so there is no permit application for the water fight to hold up. (3) If the Water Authority does not continue with its expansionist plans in the western part of the County (like serving Turning Stone, Vernon and Sherrill), there is plenty of water within the capacity of the existing treatment plant to serve Greater Utica, including the Marcy chip fab site. That Mr. Picente seems to be making new excuses for our losing the chip fab, and, simultaneously, siding with MVWA on the water fight (to the detriment of future Greater Utica and Herkimer County residents) makes it apparent that he is beholden to the same politics and special interests as his last (at least) 2 predecessors. Same old same old . . . . 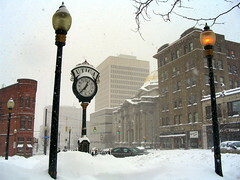 The St. Valentine's Day Storm in Utica. Why is our local BOCES growing when the county has lost more than a quarter of its population since the facility was built? The answer is not that hard to figure out, but it is one you are unlikely to see in print. It is important to remember that under Education Law §1950, the members of the BOCES board are chosen by the school boards of BOCES' component school districts, and that BOCES offers services requested by two or more component districts. BOCES is growing because (1) it was made to be a place where the local component school districts could rid themselves of their more-difficult-to-teach students and (2) too many students feel they are learning nothing in the regular classroom. BOCES is growing for the same reason that special education is growing . . . which is the same reason why the No Child Left Behind law was created: our regular schools have become ineffective. Expanding BOCES only enables more of the same and is unfair to both students and taxpayers alike. Instead, we must insist that our schools do what really works -- what we are already paying them to do. City Journal has an interesting article about a successful NCLB funded reform that gives some insight into what is going on in our schools today. There are still a number of other questions about the BOCES expansion to which answers are still needed. Hopefully the public gets to read some answers before Tuesday's vote. Unfortunately, the BOCES project informational meetings planned for 2/5 and 2/8 were canceled due to the inclement weather. We hoped to have some questions answered. However, maybe there is another way to accomplish the same thing. We know that people at BOCES read this blog. Perhaps our questions and concerns can be answered with a post on the OHM BOCES website capital project information page. Here are the questions we wanted to ask. Many are with reference to the mailing most of us received a few weeks ago. I.) Why should the disparate treatment of taxpayers among the component school districts be considered fair? While we understand that differences in state aid and numbers of students sent to BOCES can affect rates, that does not explain why the project will result in a negative rate (a tax reduction) for Utica, unless Utica taxpayers have been charged for something that they won't be charged for in the future. Clearly, the taxpayers are owed a better explanation. While it may be true that NY Mills housing values are higher than the Oneida County average, from the median household income information, NY Mills residents are clearly less able to afford a tax increase than the general county population. This begs the question, why should they (with a median income about 14% below the county average) be expected to pay more than residents in all other component districts but one (the one that has a median income about 28% above the county average)? (Formula 1) The component district's full property valuation/The total valuation of all districts. (Formula 2) The component district's Average Daily Attendance/The total Average Daily Attendance of all districts. (Formula 3) The component district's resident enrollment/The total resident enrollment of all districts. Has the BOCES Board considered the various formulae in light of median income levels in the component districts, and chosen the one that produces the most equitable result in terms of ability to pay? II.) Why is BOCES expanding programs at its main facility when the county has lost more than a quarter of its population since the current facility was built? If BOCES is expanding while regional population is declining, then it must mean (a) that the local school districts are doing less in certain areas and those functions are being transferred to BOCES or (b) BOCES is duplicating what the local districts are doing. The career and technical education portion is something that the local districts do not do, and was one of the primary reasons for BOCES, especially for some of the smaller suburban districts. -- No problem there. In contrast, the move toward increasing the special education and alternative education presence at the BOCES facility is troubling. It appears to be one of the reasons why BOCES is building classrooms for core academics and other facilities that a 'regular' school would have. Why should this not be considered duplicative of what the local districts are doing? (New York State/Federal regulations for special education will not be accepted as an explanation because if the students were kept in their home districts they would already have access to these things.) These are things that the taxpayers are already paying the local districts to do and, regarding special education, are required to do. III.) Is BOCES growing because it is providing a place for local districts to get rid of their more difficult-to-teach students? Doesn't this encourage laziness by the local districts? Long ago special education was reserved for the truly, obviously disabled: the blind, hearing impaired, and crippled. Everyone else learned in regular classes. Now it seems "learning disabled" is the big disability. But aren't these children part of the "bell shaped curve" that formerly were taught -- and succeeded -- in the regular classroom? Isn't the boom in special education really a "cover up" for failed education policies such as whole-language reading, constructivist math, and social promotion? In other words, aren't the schools ignoring their own failures by blaming the students, labeling them "special education" students? Why should taxpayers tolerate this? Why should we support this with more contributions? IV.) Why would the concentration of the more difficult-to-teach students at the main facility not be demoralizing to them? Where special education students are concerned, why does this not violate the federal "education in the least restrictive environment" regulations? The whole idea behind requiring students to be taught in regular classrooms where ever possible was to prevent the "system" from using "special education" as an excuse to cast aside the more-difficult-to-teach students. But that seems to be precisely what is occurring with this project. V.) Why should the taxpayers pay BOCES to further the education of teachers when there are already several venues in the region that serve this purpose, including Utica College and SUNY-IT? Why isn't this duplication? VI.) Why is the public presented with a fait accomplis? The BOCES Board is not elected, so it represents the will of bureaucrats more than the people. 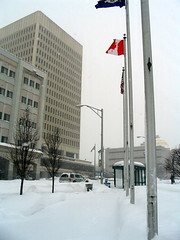 When deciding on expanding its services, why was the public not brought into the discussion? Why was the consent of the public to an expansion not sought? It seems that BOCES, like many programs in what has become the "black hole" of education, has created its own need to expand. Hopefully, BOCES will respond to these questions on its website. The story about NYRI in today's OD was disturbing in its implications. "New York Regional Interconnect hit back in a news release, saying that blocking the proposed line could "put our state on a path toward slower economic growth, degraded and insecure infrastructure and loss of opportunity, jobs and local tax revenues." "
"OUR STATE??" We don't really know who NYRI is, though, from what little is known, they appear to be Canadian investors. Who is NYRI to speak for the state? With higher electric rates, NYRI's proposal will be be another nail in upstate's coffin. New York has already put itself on a path toward lost opportunity, but we don't need outsiders to tell us how to run our household. When the situation hurts downstate enough (those who would benefit from NYRI), New Yorkers will find a solution that is fair to ALL New Yorkers. How dare a private company try to impose its will on a region. How dare the federal government cooperate! As most us older folks learned in school, the federal government is supposed to be limited, with most of the powers of government reserved to the states and the people. But the Congress and the courts have year-by-year expanded the role of the federal government into aspects of our lives the would make the Founding Fathers roll over in their graves. NYRI's statement reflects an attitude that unfortunately has been accepted by government: that private corporations know what is best for the people. Those who have the inside track with government officials can get what they want. The courts seem to have gone along with this (as in the Kelo decision). When the general public no longer feels safe and secure in their homes, the government is not doing its job. We are fast approaching that point. After a brief awakening and some quick-fire, well-written posts, the Mohawk Valley View Blog is no more. Blogging is time-consuming, and can interfere with other endeavors (including mundane things like paying bills, doing laundry and balancing the check book). We understand why Mrs. Mecomber has decided to close her blog. Nonetheless, her entertaining posts and insights will be missed. Good luck to you, Mrs. Mecomber, in whatever you do. This is sad, not only because we will miss her posts, but because there is strength in numbers, and the numbers have decreased. Politicians tell us that people "are clamoring" for this or that -- but often the impression is false, and is given to implement some private agenda. Blogs help expose what the public really feels . . . but for that to be accurate, the more bloggers the better. Additionally, everyone has a unique perception of the events of the day. Some through specialized knowledge, their station in life, having a special interest and a willingness to do research, or just being in the right place at the right time, may have a perspective that others can benefit from. Blogging can be an outlet for that. Hopefully more bloggers will rise from the ranks to take Mrs. Mecomber's place. If you are blogging about Utica-Rome-Mohawk Valley news and views, Fault Lines will provide a link to help you get started with some traffic. Thank you, Observer-Dispatch, for taking off the rose-colored glasses and giving us a hard-hitting story today about the Griffiss Institute's failures as compared to the Sentinel's story yesterday on the GI's new plans for expansion as a business incubator. A Google Search on "Griffiss Institute for Information Assurance" produced a plethora of hits which provide a virtual time line of events and give more depth to what came out in the Sunday OD. After reading these, the only feeling left is sickness. The Griffiss Institute for Information Assurance was launched, like other Pataki-era local news-grabbers, with much political hoopla in September 2002. "This new collaboration will establish Rome as a national center of research and economic development in the field of information security—bringing new high-tech jobs and private sector investment to the Mohawk Valley," Governor Pataki said. Two months later the first employee was hired: a "chief scientist" who was supposed to formulate a "technical vision" for the Institute that would help it to secure research grants. This Chief Scientist, splitting his time at GI with time at Cornell, expected the Institute to "become a focal point, rather than a new competitor" among the New York's institutions that were involved in cyber security -- a place for them to join together. According to news accounts of the day, the first year administrative budget was supposed to be about $1 million, including $175,000 for a director, $80,000 each for two associates, and $75,000 to Cornell for the Chief Scientist. The budget should have been a tip-off that things were not right because it seems a little top heavy in administration and very light on what was supposed to be its main mission, research. GI's Form 990 for 2003 reveals what actually occurred, which should have been another tip-off. On total revenue of $314,641, $290,451 was allegedly spent on program "services." Closer inspection, however, reveals that of these "services" only $75,000 was spent on research (presumably the Chief Scientist's pay), with the bulk of the remainder ($206,250) spent on the Executive Director's salary for an alleged average 40 hours of work/week, although the Executive Director actually took a total of $222,025 (see p 7) that year, with the additional amount being legal fees. I.e., almost 71% of the first year's revenues went to the Executive Director . . . A sweet deal for the Executive Director . . . but with so much money going to one person, how would the Institute have the manpower to get anything accomplished? It is not really clear what was accomplished in 2003, other than an invitation-only symposium to kick off GI's existence. The Chief Scientist indicated that the symposium would give the participants a chance to present an overview of their work and provide an opportunity for them to talk to each other. All this for a "tête-à-tête" seems rather extravagant. Interestingly, the Executive Director in the news account indicated that the Institute was "partnering with local academic institutions to train young people for careers in information assurance." Funny, the concept of training young people did not come through the governor's original announcement of GI only a few months earlier. (One thing this blogger has learned, the word "partnering" is usually a red flag for some sort of shenanigan, especially when educators are involved.) It should have been a tip-off that something off-target was going on. By the end of 2003, the first Chief Scientist was to be replaced by a new Chief Scientist from Syracuse U. The first Chief Scientist, meanwhile, in early 2005, went on to become Chief Scientist for "a new Science and Technology Center, that will bring together researchers with a strong background in security research from eight academic institutions along with industrial and government partners." The description of this "center" sounds awfully similar to GI, n'est-ce pas? Where the Cornell press release gives a description of the Chief Scientist's previous experience, GI's status was demoted to merely "a New York state security consortium." So it would appear that the concept behind GI was moved to the first Chief Scientist's home turf -- where he could head it as Chief Scientist. So much for GI being the "focal point." In a 2004 speech, the Executive Director of the New York State Office of Science Technology & Academic Research (NYSTAR), gushed that "The Institute has established Rome as a national center of research and economic development" and that "The more than 60 academic partners with the Griffiss Institute represents the absolute cream-of-the-scientific crop." The NYSTAR exec sounded like a shill for the Pataki administration because he identified no specific project that GI was working on, in contrast to the several other institutions mentioned in his speech. His statements regarding GI: lots of puffery . . . but no substance. 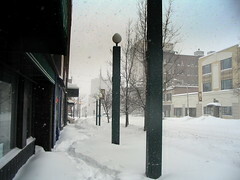 In 2005 GI lost one of the floors in its building when its landlord rented it to a local business. Of course, this was spinned as a success, but it should have been a tip-off. By March 2006, the Institute reorganized and officially shifted its focus from research to training. While the EDGE press release claimed that "At its inception, the GI was designed to concentrate on three major areas: basic and applied research, training and degree education, and information assurance products and services," that is not so clear from the original 2002 Governor's press release which emphasized research. So now, four years after the initial announcement and after spending 4.5 million state taxpayer dollars to fix and equip GI's building, supposedly for research, the OD reports that the Griffiss Institute never produced any research on its own and never even applied for any research grants. It is amazing that the principals involved can claim as a roadblock the federal requirement that grant applications have a sponsoring college research institution when several colleges and universities are represented on GI's Board of Directors, including Cornell, SU, Utica College, and SUNY-IT. It is also amazing that they can cite a federal accounting requirement forbidding pass-thru of federal funds to GI as a roadblock to GI's work when they have high-powered legal assistance on their payroll. The first Chief Scientist had it right, right in the beginning: GI would not be a competitor. But maybe the real reason is because Cornell, SU and UC, all of whom sit on GI's board and have competing programs of their own, would not want any competition. About all GI has accomplished is a "cybersecurity boot camp" for high schoolers ... but even that seems to have been taken over by SU for its own. The Griffiss Institute seems to have been "Dead on Arrival," picked to pieces by the people and institutions responsible for its very survival. Now GI wants a new mission and a new life. A Loose End . . .
We still don't know what Judge Tormey decided in the Utica OD - OCIDA - NYRI litigation. It might be interesting to see whose names are on that lease and How Much NYRI will pay the railroad for use of its right-of-way. As expected, NYRI strikes back against the state law intended to remove its powers of eminent domain. "It's unconstitutional for the legislature to pass a law that targets one person or company, or singles them out for different treatment," [power line project manager William] May said. That may be true, and certainly is a good argument. . . . It might even persuade a court . . . But let's not lose sight of the forest by focusing on the trees. The power of eminent domain is a government power, not a private one. It must be used to promote the public interest. And this is what makes this matter different from the usual "violation of equal protection of laws" situation. NYRI only had the power of eminent domain because the legislature, at one time, gave it that power. Obviously, the legislature has changed its mind. "The law seeks to punish NYRI for proposing a project that is intended to meet a public need," . . . May said. No, the law seeks to prevent NYRI from creating a public harm. While NYRI can argue that it is fulfilling a public need, it is the legislature's prerogative (not a private corporation's) to determine whether the exercise of its power will serve the public interest. It arguably could even be a violation of the separation of powers doctrine for a court to decide otherwise. And when talking about what is or is not Constitutional, let's not lose sight of from where the Government gets Its power: WE THE PEOPLE. While multinational corporations seem to be remaking laws world-wide to suit their liking, and while they seem to be aided and abetted by many elected and non-elected officials (maybe even at the highest legislative, executive and judicial branches in this country), ultimately, under our Constitution, the will of the people must prevail. And when the government no longer derives its powers from the consent of the governed: "it is the Right of the People to alter or to abolish it, and to institute new Government, laying its foundation on such principles and organizing its powers in such form, as to them shall seem most likely to effect their Safety and Happiness. . . . "
Two of our favorite bloggers, "Sleeping Beauty" (a/k/a Mrs. Mecomber at Mohawk Valley View) and "Rip Van Winkle" (a/k/a Al at CNY EcoBlog) are awakening from their sleep and posting again. Check out their blogs.